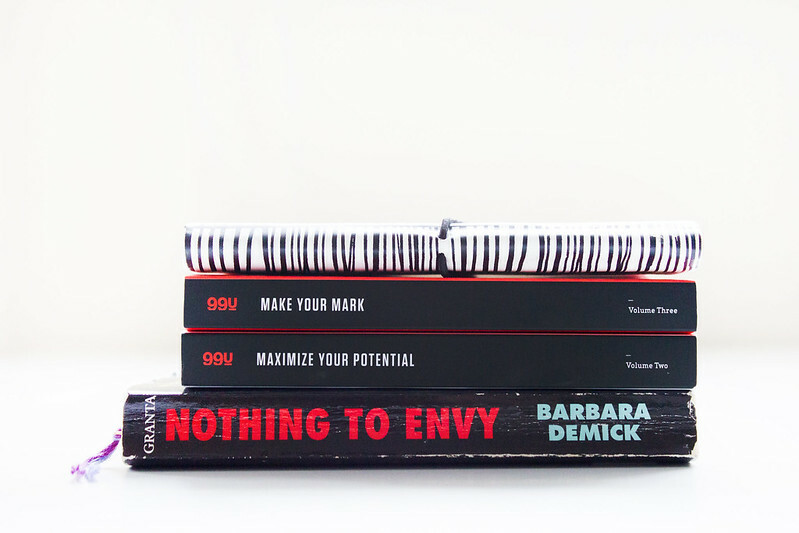 This series of books by Jocelyn K. Glei and 99U (Behance) are phenomenally good reads for creatives, small business owners, and entrepreneurs. I own all three books and hope they continue to produce such high quality publications; the format and writing style is fluid, inspiring, and enlightening. Make Your Mark provides practical insights into building and maintaining a creative business, defining purpose, building products, serving customers, and leading teams. So creepy it gave me nightmares; The Ritual tells of four old university friends, hiking in the Scandinavian wilderness. With two of them struggling and all of them feeling frustrated and tried, they try a shortcut in the hopes of cutting their hike short, which results in them becoming lost in untouched forest. A forest where a bestial presence stalks their every move. I had such high hopes for this book, I loved Tina Fey's Bossypants and I kind of expected to love Yes Please just as much but I didn't. I couldn't relate to it, there were a couple of chapters that made me wince, some of the topics simply weren't that interesting, and I just didn't find it funny. Sorry, Amy. Maximize Your Potential is possibly my favourite of the three books written by Jocelyn K. Glei and 99U; this book deals with cultivating creativity, building relationships, taking bold (yet calculated) risks, and reaching out for new opportunities. I don't know what it is about this series of books but, after reading them, I feel I can achieve anything. This series is optimistic, encouraging, and insightful; the creative advice is practical and easily incorporated into daily life. Utterly heartbreaking. I honestly don't think I can do this book justice by reviewing it - read the book and then talk to me about it. I do want to say that I am very aware of how incredibly difficult it is to distinguish between propaganda and the truth. Not just from North Korea either; I have a feeling there is a lot of smoke and mirrors happening on our side as well. I've been a bit dismayed at the mediocre reviews for Yes Please so far! I have it on reserve at the library and have been looking forward to it, so I hope I can get at least a little enjoyment out of it. If not, there's always Leslie Knope to watch + admire. Wyatt. true that Daniel `s storry is unbelievable, last wednesday I bought Saab 99 Turbo after having made $5404 this-past/5 weeks and-more than, ten thousand lass month . this is actually the nicest-work Ive had . I actually started 9-months ago and immediately started to make at least $76 p/h . try this site. Totally agree re. Nothing to Envy. Harrowing stuff. I own the other Jocelyn K. Glei book and when I finish that I'll definitely check these two out. Maximise your potential sounds super relevant to my life right now. These Jocelyn K Glei books look like what I need! The Ritual sounds intriguing. It's a really tough read at times, I found it upset me quite a lot. I want to read more about North Korea as I feel there are a lot of aspects the book didn't cover. I love this series, I hope they make more; the books are so good at being informative without being too heavy on the business theory. It made me incredibly sad at times, utterly heartbreaking. Hmm, yes, it's.. a little.. boring. I hate to say it because I love Amy Poehler and I think the only part I really laughed at was right at the beginning, where she is fretting over how she doesn't want her book to be bad especially in comparison to Tina Fey's.. oops. Nothing to Envy has me intrigued! Awesome recommendations as usual! Bummer that Amy's book isn't as great as Bossypants! And I immediately added Nothing to Envy to my reading list. I really recommend reading it, I think we all need to learn more about North Korea. thanks for sharing, definitely going to check these out! The 99U series is amazing, I can't recommend it enough. I'm halfway through Nothing to Envy and can't put it down. It is both heartbreaking but also heartwarming, at times; I'm amazed by what people are able to endure. Have you read Wild Swans? It follows three generations of women (the author's family) in Mao's twentieth-century China. I'm going through my bloglovin' feed & just now getting to this post - I felt the same way about Yes, Please - I loved Bossypants but didn't feel the same about Amy's book. Sadly.